And so it’s that time of year again : let the debating begin, I suppose, as the various “Top 10” lists begin to hit the internet in earnest, but one thing I think we can all agree on — it’s been quite a year in the world of comics. The underground lost luminaries Jay Lynch and Skip Williamson, the mainstream lost Swamp Thing co-creators Len Wein and Bernie Wrightson — there have been some tough moments. 2. Some stuff that came out very late in 2016 will be sneaking its way onto these lists, not only because I didn’t get a chance to evaluate it before writing my wrap-up columns last year, but also because many comics, particularly small-press comics, don’t find their way into the hands of most readers until a good few months after they’re released due to the fact that they’re not distributed by Diamond to bookstores or comic shops. Self-publishers, especially, often sell their creative wares on personal websites for some time before “catching on” with small-press distros like Spit And A Half, etc. And then there’s the whole situation with My Favorite Thing Is Monsters, which rolled off Korean printing presses in October of last year — but only a small batch of advance review copies made it here to the US before 2016 was out, the rest remaining stuck in the Panama Canal Zone until March of 2017, since the guy who owned the cargo ship they were coming over on had some back bills to pay before he could get his vessel out of hock. 10. I Wish I Was Joking by Tom Van Deusen (Poochie Press) – Van Deusen has long been one of the out-and-out funniest cartoonists out there, and this may very well be his best comic yet since he makes his stand-in “alternative” newsweekly reporter actually likable for a change. Less caustic than his previous works, but much more — dare I say it — charming. 9. Cosmic BE-ING #5 by Alex Graham (Self-Published) – Graham’s serialized Angloid story has its strongest outing yet, and also its most, believe it or not, down to Earth. Still “trippy” and “New Age” as all get-go, but far more anchored in workaday bread-and-butter concerns than prior installments. Graham’s remarkable illustration skills are really hitting a creative stride now, as well. 8. Trim #5 by Aaron Lange (The Comix Company) – Probably the most compelling issue of Lange’s annually-issued “solo anthology” to date, with intriguing explorations of his family’s German ancestry and a “cool” pastor he knew as a kid among the highlights. Plenty of laugh-out-loud gag strips, as well, most centered around the cartoonist’s art school days. 7. Lovers In The Garden by Anya Davidson (Retrofit/Big Planet Comics) – Some might argue that this is a “graphic novel,” but I’d call it “novella” length at best. Categorize it however you want, though, there’s no doubting that Davisdon’s assured cartooning makes her ’70s-grindhouse-style tale of dope dealers and cops a highly memorable read that holds together way better than most “vignette”-centered comics manage to. 6. Malarkey #2 by November Garcia (Self-Published) – Not just the best thing going in autobio comics right now, but the best thing to happen to autobio comics in years — and Garcia’s slices of life look even better with a little bit of color added to the mix. Possibly the most endearing comic you’ll read this year, which still seems a bizarre thing to say given most of its contents deal with alcoholism and neuroses, but there you have it. 5. Now #1 (Fantagraphics) – Eric Reynolds’ new anthology gets off to a more-than-promising start, with standout contributions from Eleanor Davis, Noah Van Sciver, Kaela Graham, Dash Shaw, and many others. 128 pages of the best in contemporary cartooning for ten bucks? Come on, you can’t do better than that. 4. Crickets #6 by Sammy Harkham (Self-Published) – The most deliriously arresting chapter of “Blood Of The Virgin” yet, as Harkham delineates the immediate, and seemingly complete, ruination of his protagonist’s life in rapid-fire fashion with an intriguing mix of empathy and clinical distance. I get the distinct impression that he doesn’t like Seymour all that much, but feels bad about what he’s doing to him regardless. Visually literate to a degree that’s almost painful. 3. Your Black Friend by Ben Passmore (Silver Sprocket) – The winner of the 2017 Ignatz award for “Best Comic Book,” Passmore’s monologue on the reality of black life in America is concise, superbly-illustrated, and absolutely compelling. 12 pages you’ll never forget — because you’ll be reading them again and again. 2. Providence #12 by Alan Moore and Jacen Burrows (Avatar Press) – The conclusion to Moore and Burrows’ “Lovecraft Cycle” is every bit as harrowing and terrifying as the previous 11 issues had suggested it would be, and then some — in fact, it’s downright devastating. It’s well past time to put this series in the discussion of Moore’s all-time best works, and Burrows absolutely pulls out all the stops in bringing the existential horror of the dawn of this dark new age to life. A bona fide masterwork. 1. 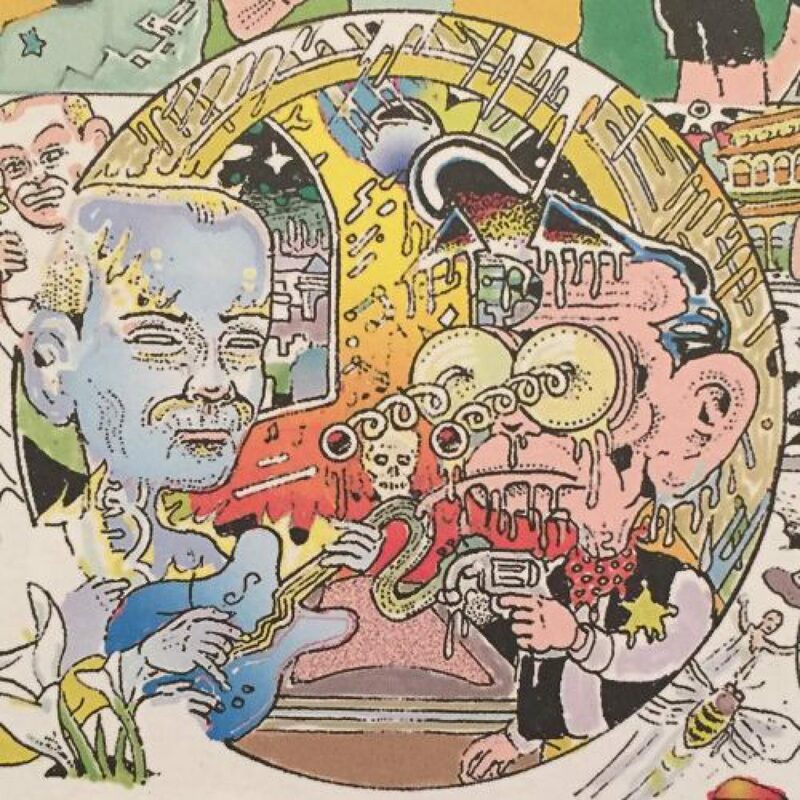 Songy Of Paradise by Gary Panter (Fantagraphics) – Okay, I admit this one’s a bit of a cheat given that it’s an oversized (to put it mildly) hardcover boasting a $35 cover price — but for all that, it’s still only 32 pages long, so that makes it a “single issue” in my book. And a damn engrossing one at that, as Panter finally puts his Paradise/Purgatory trilogy to bed with its most deceptively “simple” (as in, it’s anything but) segment yet. Rest assured, though, even if you haven’t read the other two books, this is an accessible, engaging, thought-provoking work that reveals more of its hiding-in-plain-sight secrets with every reading. A truly seminal effort from one of the most important cartoonists of his generation — or any other. Thank you for putting such a comprehensive list together!